This web-user gave a score of 4 / 5 to Vacances Bleues on october 2017, but declined to leave a comment. 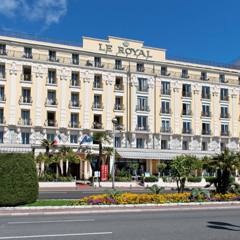 We always enjoy our stay at the Royal . The staff are friendly and efficient . The good is to a high standard generally speaking although I'm 2 evenings we were unable to have our choice of meal as they had run out . This was the time rabbit was on the menu and previously Strogonovf. We were disappointed . Otherwise excellent . perfect location, friendly stuff, excellent breakfast. they do not change bedclothes every day. Great value for the location, would stay here again. This web-user gave a score of 2 / 5 to Vacances Bleues on september 2017, but declined to leave a comment. Beautiful regency style combined with modern convenience, and a great breakfast. This web-user gave a score of 3 / 5 to Vacances Bleues on september 2017, but declined to leave a comment.